HALLMARK 2002 DELTA FLYER Star Trek: Voyager MAGIC Ornament ~~~ Hallmark Ornament DELTA FLYER Star Trek: Voyager 2002 is a rare and hard to find Hallmark ORNAMENT. 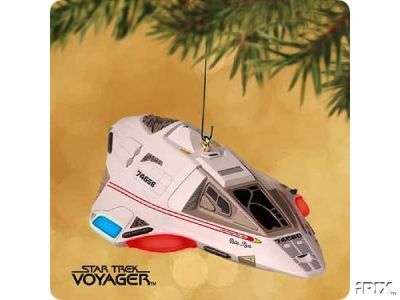 This awesone ornament will be a favorite for any Star Trek fan. Designed by Lynn Norton. The Delta Flyer was originally intended as a space-faring "hot rod" by a crew member known for his keen interest in 20th-century automobiles. This Keepsake Ornament adds a bit of magic with its RED & BLUE LIGHTSand a MESSAGE from the captain of the U.S.S. Voyager: "This is Captain Janeway of the Federation Vessel Delta Flyer. We are on a mission of peaceful exploration." Ornament is MINT IN ORIGINAL MINT BOX, Smoke Free, NEVER USED OR DISPLAYED. Also enclosed is a Hallmark Christmas Memory Card!!! Please email if you are interested in any other STAR TREK ornaments. 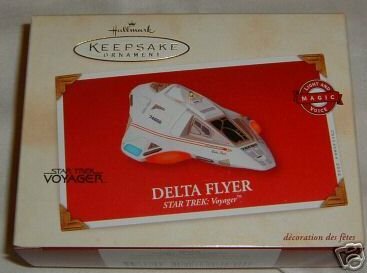 Items Similar To "DELTA FLYER Star Trek Hallmark Ornament 2002~Lights & Voice"